Most of China’s water resources are found in China’s western regions with 70% coming from China’s southwest. Since the beginning of this century, the core of China’s hydropower development focused on middle and upstream portions of rivers in southwest China. This region also serves as the central native land of many of China’s ethnic minorities. In early 2013, China’s State Council issued a plan for resource development in its 12th five year plan with details to design and begin construction on more than 60 major hydropower projects between 2011 and 2015. China is entering into an explosive period of rapid and unprecedented development of its hydropower industry. For the next twenty years more than 8 million ethnic minorities will be affected by the development and planning of dams. 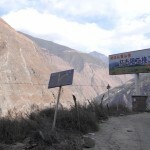 With the expressed state agenda of establishing a sustainable hydropower industry, achieving social stability in ethnic minorities areas, and realizing the “Chinese dream” for all of China’s citizens, how will the Central government guide law and policy to provide rational standardization, coordination, and management to the interests of the state, industry, and of ethnic minority groups? According to the principles of “Encouraging the Benefits of Ethnic Autonomous Areas” set forth by the Chinese Constitution, the Law of Ethnic Autonomous Zones advanced a new regulation in 2005 to “encourage the production and livelihood of local ethnic minorities.” This broad-based regulation passed as part of one of three items in the addendum to the State Council’s PRC Legislation on the Autonomy of Ethnic Regions. Yet to date, there is no specific clarification to the rights of local ethnic minorities or details concerning the autonomy of ethnic areas within the language of the basic law. The administrative regulations of the State Council list only one related clause: The regulation of peaceful migration should respect the production methods, the lifestyle, and customs of ethnic minorities. A new policy promulgated in 2012 by the National Development and Reform Commission (NDRC) requiring state sponsored development projects to first oversee the migration of peoples before beginning construction has no mention of protecting the rights of local ethnic minorities. Laws and regulations related to the issue of ethnic minority protection do indeed exist, but because there is no guarantee on the methods of protecting procedural justice or monitoring processes, these laws and regulation cannot reach efficient levels of execution. Not long ago, the publications of the Third Plenary Session of the 18th Party Congress emphasized the Chinese Communist Party’s views of ethnic policy, guaranteeing the legal benefits of ethnic minorities and bolstering and developing the equal unity and mutual harmonious relations of socialist peoples. 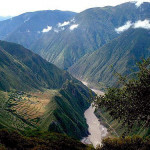 In past years, researchers carrying out investigative field study on the beneficial effects of hydropower development toward the ethnic peoples of the Jinsha River, Lancang (Mekong) River, Nu (Salween) River, Yalong River, Min River, and the Dadu River discovered that the everyday livelihoods and production methods of ethnic peoples living along these rivers are immensely affected by the development of hydropower projects. In the early development and planning stages, hydropower projects are requested to maintain a holding status before beginning construction. For many unknown reasons this holding status could continue for many years. The clearing of roads with dynamite creates air and noise pollution and along with the risks of falling rocks and landslides, greatly affects the safety of people and livestock and the volume of agricultural harvests. Dam construction and rising waters force people to move. This uprooting destroys longstanding social networks, privately held assets and shared natural resources such as traditional collecting, fishing, and grazing methods that rely on forests, pasture lands and wetlands. What is lost is not justly compensated for. The rights of ethnic groups to be informed, to participate, to express views, and to monitor procedures are not respected or guaranteed with the development of hydropower projects and in many ways these rights are illegally violated. The relevant institutions of local governments cannot realistically carry out existing laws and regulations, and hydropower firms ignore the law failing to take social responsibility for the protection of vulnerable groups. Large scale hydropower firms – particularly central level hydropower firms – exact great profits from local areas but remit taxes to the major cities in which they are registered. The benefits received by localities are greatly out of proportion with the costs borne. In consideration to the issues raised above and to the demands of the 18th Party Congress, the suggestions below should be considered. Generally, the Central government should re-examine existing hydropower projects and immediately clarify and formulate policy that guarantees the benefits of ethnic peoples in China’s western regions affected the by hydropower development. In western ethnic regions, the Central government should incorporate a guarantee of the basic rights of ethnic peoples as an indicator of sustainable development. The Central government should coordinate development of hydropower projects in ethnic areas giving basic consideration to resource safety, economic development, guarantees of the rights of ethnic peoples, and ecological protection. The activities surrounding hydropower development should respect and guaranteed the basic rights of ethnic people including political, economic, and cultural rights. In accordance to law, ethnic peoples should not be discriminated against and should equally participate in and enjoy the benefits of resulting from economic development in their localities. They also have the rights to maintain their value systems, religious observance, and unique ways of living. Moreover they have rights to protect the natural resources such as the land, rivers, forests, and pastureland on which they have existed for many years. Moreover, the Central government should amend the legal and policy framework on the Law of Ethnic Autonomous Zones within the Chinese Constitution to protect the basic rights of citizens and ethnic peoples. While strengthening relevant polices, the Central government should expedite policy on formulating specific guarantees of the protection of peoples affected by hydropower development and ensure the implementation and execution of these policies. In the development of hydropower projects, firms and local governments should respect and protect the rights of ethnic groups and individuals to be informed, participate, make decisions, and monitor procedures. Hydropower firms should establish corporate social responsibility systems that pay particular attention to respecting and protecting the rights of ethnic peoples while operating. Firms should incorporate this kind of responsibility into their specific duties and make public record of their CSR work on a regular basis. Firms should also take initiative in accepting monitoring presences of multiple levels of society. The Central government should establish systems for assessing the impact on the rights of ethnic peoples. Results of the impact assessment should serve as key findings for the approval of hydropower projects. The Central government should monitor the entire process of relocation of people related to hydropower development and provide support and effective relief to ethnic peoples whose rights are violated. The government should establish and open various channels of complaints mechanisms, provide various forms of legal assistance, and eliminate obstacles that prevent ethnic groups and their members in accessing these systemic mechanisms to realize their rights and receive relief. Hydropower firms and local governments should make best efforts to reduce the relocation of people due to hydropower construction and resolutely block forced migration. Hydropower firms and local governments should make best efforts to reduce the negative impacts of hydropower development on ethnic people’s environment, economy, society, culture, and spirit. Hydropower firms and local governments should provide fair and appropriate compensation to ethnic groups and individuals for the material, physical, and spiritual damage and impacts caused by activities related to hydropower development. Hydropower firms and local governments should appropriately provide accordant compensation for negative social, economic, and cultural impacts of past hydropower projects on the basis of social impact assessment and an impact assessment on ethnic people’s rights. Hydropower firms should provide monies for the protection of resources and development funds in affected communities. Firms should provide compensation to and protect the resources and development of intangible assets, communally shared natural resources, and collective impacts that are difficult to compensate at the individual level. Local governments should adopt measures to protect the cultural heritage of ethnic peoples, to aid ethnic peoples in the passing down and development of their own history, culture, language, traditions, and customs and guarantee the protection of their own cultural heritage and historical traditions. With the reforms of China’s government institutions and new rounds of innovation in public administration, the function of social organizations in public administration and social life becomes more apparent on a daily basis. The government should make full use of social organizations in regard to the protection of ethnic peoples and western hydropower development. The Central government should encourage relevant social organizations to participate in the activities of local hydropower development, participate in the ecological impact assessment, social impact assessment, and social monitoring of hydropower development. Finally the Central government should utilize the contracting of services to support positive contributions and innovative practices that social organizations can make toward the social administration of ethnic areas. This is the final part of a 5 part series on hydropower and the rights of ethnic minorities living in the upper Yangtze River valley. Link here to part 1. Thank you for a very insightful and thorough series of articles describing the highland watershed development challenges. Many thanks to you and your colleagues for all the great work you are doing! I do, however, want to challenge some of the assumptions behind the proposals you have put forth for bettering the conditions of the affected communities. The major issue is that of “ethnic rights”. The Constitution (Par. 4) is sparse on definitions and does not specify a difference between ethnic minority individuals and the group as a whole, and as a result, there is very high uncertainty on whether rights are accorded to the ethnic minority group or to individuals of that ethnic group. It is however clearly emphasized that autonomy is granted to the AREA and not the ethnic group. The 1984 Law on Ethnic Minority Area Autonomy hardly clarifies these matters any further. As a result, is uncertain to what extent claims about rights can be raised in the name of ethnic minority groups under Chinese domestic legal framework. There would be less uncertainty surrounding questions about village lands per se since those are held by “collective” which, albeit not defined, is a functional and strong legal concept here in China. In the ideal world, the problems of informed consent and fair participation would be addressed through the regular legal process for land development. Albeit delayed, the development that is hitting the uplands is in many ways a repetition of what has happened uncountable times all across, be it dams, roads, or apartment blocks. When it comes to development projects, it is no news that fair and correct (both to the letter and in the spirit of the law) procedures are observed very rarely, if ever. With this in mind, I question the long-term appropriateness of evoking ethnic minority rights in a group sense, which is how I interpret the above proposals. For one, although Chinese legal and political system makes a distinction between the general population and the ethnic minorities, in light of the fact that development in China in general is oftentimes unjust, is it appropriate to call for the protection of ethnic minority group rights when similar group protection is not provided to other communities facing uprooting due to development? The invocation of indigeneity further promblematizes the argument that ethnic communities deserve special consideration. While the UN Declaration on the Rights of Indigenous People does indeed call for various forms of protections when facing development program, one has to keep in mind that not only is a UN declaration the international law equivalent to asking for good fortune from the tooth fairy, but more importantly, Chinas acquiescence to this document comes with a very strongly worded disclaimer that it in no way pertains to domestic issues in China (see http://ej.uz/4ebc for detail). It is therefore the case that any claims that directly or indirectly evoke indigeneity of the highland people are extra-legal in the Chinese context. This might not be a bad thing per se, as it has been well demonstrated that strong emotional appeals might have a stronger impact than legalise argumentation in getting certain development projects modified or even halted, but any long term strategy for people-friendly development in the highlands would be stronger if it stayed within the limits of the Chinese law rather than attempting to fundamentally alter it. If the introduction of indigeneity as a brave new legal norm is the goal, that has to be done head on and in clear terms. Obviously, the proposals listed above do not shy away from bold changes and ideas. The clarifications and strengthening called for in the Proposal 1 are urgently needed, especially the inclusion of hydroelectric dam development in the ethnic areas autonomy regulatory system. However, besides addressing the dams, is the rest of the proposal just a long-worded call for the Central Government to actually enforce the existing law, or should the laws be fundamentally changed? The calls for companies to act responsibly expressed in Proposal 2 are spot on. The proposed management improvements would enhance the company operations and in the long term strengthen the company performance. Calling on the government to pay EXTRA attention to make sure that companies respect the rights of the ethnic minorities in the context of development projects, however, has to be based on sound legal arguments rather than passionate yet abstract invocations. Calling for what amounts to royalty sharing is truly ambitious and Proposal 3 provides several innovative approaches to doing just that. However, the question of why every community in China should not be entitled to exactly the same kind of attention and care remains standing. As to Proposal 4, it is hardly worth wasting pixels on the screen explicating why a shift from governing towards governance is a good thing. Listen up, powers that be!